Need TV Antenna Repairs in Brisbane? Call Jim’s Antennas on 131 546 to get TV reception problems sorted. Professionally & Fast! 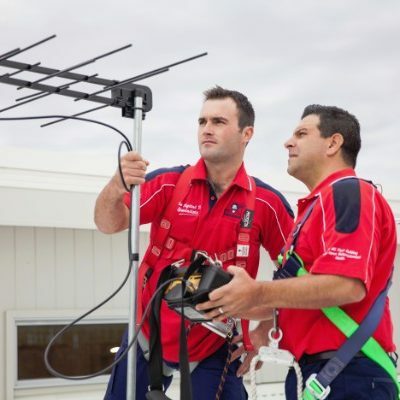 Don’t put up with a substandard TV Aerial; Call the Brisbane Antenna Experts in today on 131 546 [7 days from 8am-8pm] or Book a Time for a Free Quote Online now. We provide a no obligation free quote service, subject to site inspection with no call out fee. Our Digital TV Antenna Experts carry a range of TV Antennas to ensure the correct digital antenna is installed that best suits the Brisbane location. This is important, as often an off-the- shelf “all purpose” antenna will result in substandard tv reception in specific areas; some locations get better reception from a UHF Antenna, depending on the nearest tower and the topography. Other locations may benefit best from Satellite TV installation for optimum performance. Price was initially too high, but they ended up doing me a deal because they were doing a job just across the road.